Many businesses around the world are motivated to reach common goals—to grow and earn profit. From the creation of marketing plans to increase sales up to the conceptualization of creative advertising ideas to convince customers that they provide the best products in the market, businesses are giving the best of their efforts to get a huge chunk of the market share. Definitely, competition is ever-present in the industry, and if they want to get nearer to the buying public, they have to adapt to the technological changes that sets a trend in the business community. Enterprises today cannot take for granted the emerging trend of shopping online. While it provided with them with a universal platform to showcase their brands, products, and services, this on the other-hand can require another effort in creating and designing an effective online page. An e-commerce website became a popular business necessity and it is purpose is not only to sell, but also to provide consumers with updates and useful information about the offers they are marketing. Why CMS is a Must in Creating a Website? Like building your own house; the over-all plan, the materials, and the people who will participate in its construction determine the end product. In the creation of the website, a functional enterprise web CMS or content management system play a vital role in ensuring that your website will appear pleasing to the eye of the end users. Your CMS is the backbone of your website, choosing it right will give you an opportunity to have a website that is easy to manage and is fully functional for the visitors. To answer the question why CMS is a must in creating your website, it reason is very simple—without a CMS, there is also no website to exist. We mentioned above that it is very important to choose the right CMS, but right can be subjective for different businesses because they may require a platform that is according to the nature of their industry. Moonlighting as a web developer and content writer at the same time, I find it critical to the success of an online page on how they present their website, design-wise and content-wise. When a client asks for a simple website with a few technicality requirement so that they can easily post blogs with given themes to customize, WordPress is a good pick. If they want a personalized design for full-forced online branding, starting from scratch with Drupal can be their best bet. Moreover, there still are plenty of CMS (though not popular) offers the best experience of a business need. Ever heard of elcomCMS? How about ExpressionEngine? There are long list of amazing CMS out there, and they are just waiting to be unlocked. Below are few points that a business owner/web developer have to consider in choosing a CMS. Always think of the users. No matter how techie you are and you found a CMS you can easily work with, the only way that it will count is if you will be the lone person to use it. Not everyone is a tech savvy like you, and you have to think of the people who will update the site in the future as well as the online users who will navigate on the site. Make sure that the CMS you will use have the functionality that you need. It doesn’t matter if the CMS has a big or small following, what is important is it can provide you with all the features that you need. Do your homework before settling on a particular CMS, there are myriad of choices out there and doing even a small research can make a big difference on how your website will perform in the future. Building a compelling and user-friendly website is a challenging task. Web developers and business owners alike unearths their resourcefulness and creative abilities to create an online page that future online clients will enjoy browsing. To produce high quality page that Internet users would be glad navigating, business owners must select a capable web-designer to do the job. It is the web development team’s responsibility to give you a proposal on how to present your products or services online in a creative and functional way. Owners should know that their website is the face of their business in the World Wide Web, and its purpose is not only to sell, but also to provide users with helpful information about your offers. However, more to a well-designed internet portal, your web page should also be search engine optimized for search engine visibility. Should You Follow The SEO Trend? When I was new in the Internet marketing field, all I knew is that websites are created to showcase what a business offers. I did not know that Google is ranking online pages, and I was a bit surprised that it that the search engine rankings can actually be “manipulated.” As my experience in the industry lengthens and my knowledge widens, I realized how important SEO is for every website that aims to market their business online. Without SEO, you may fall behind your competitors and you’ll just find out that they are doubling their sales when it is crystal clear that you provide better offers. In the competitive world we are living today, SEO or Search Engine Optimization plays a great role in web development and online marketing. If you are to ask me if you should implement SEO in your newly designed website? My answer is a big YES. What SEO and a compelling website can do for your business? In Search Engine Marketing, “traffic” refers to the number of people getting a view of your website. It is the online audience who can also your prospective clients. The higher your traffic is, greater is the possibility for you to gather more purchases that will result to more profit. In business, you need customers, and being on the top of the search engine rankings is your ticket to be seen by customers. SEO is very beneficial when it comes to targeting prospects since it will allow your page to be seen easily through “key phrases” related to your business. Most of the time Internet users use search terms that will direct them to the results page. When a user indicates your product in search engines like Google, Yahoo, or Bing, and you are listed on the top, there is a big possibility that you will be visited. Be reminded that being on top of the searches does not only get you the bigger chunk of visiting consumers, it also makes people aware of your brand and business identity. With the effective use of social media collaborated in SEO, you are allowing more people to know what your business is. If you are only a supplier in a particular locality, Local SEO is also very helpful since it narrows your business according to your target audience. More people aware of your brand is one key to successful online marketing campaign. It is essential for you not to forget that visibility is highly essential for you to gain and to grow. To maximize the possibility of your website being seen in search engines, it is a must that you look for an internet portal that is naturally friendly to search engines. Good SERP rankings and web design works hand in hand in building the name of your business. Information runs today’s modern economy. Businesses rely on huge amounts of information to conduct business, increase sales, target advertising campaigns, and analyze buying trends. Fortunately with the onset of technological innovation, this information can be maintained digitally because if one of today’s Fortune 500 companies had to keep its information in printed form it would take several multistoried buildings to store it. Most of today’s successful companies have both external and internal presences on the internet and these require huge quantities of regularly updated information. A web content management system is a good way for companies to management these quantities of information. These content management systems have programs and equipment that help manage all this information. CMS intranet systems use electronic systems to organize data so that it can be retrieved, searched, updated, and shared throughout an organization. Using database technology, CMS employs sophisticated search technology to help retrieve filed information quickly and efficiently. The CMS must employ a high level of document interoperability. All documents including spreadsheets, databases, wordpressing files, .PDF files, and all other types of files must all be cross-referenced and categorized, so that when any search is conducted all information that is relevant becomes available. Additionally, intranet CMS interoperability also provides multiple organizations and many government agencies the ability to share information when necessary even when using different systems. Intranet CMS can truly improve information sharing and because of this companies should set policies in place to ensure controls are established to secure the company’s information. Procedures should be established naming intranet CMS account administrators and account authorization access procedures. A secure facility should be established and the administrator should determine who should have be able to gain access to which content and how. Access rights to documents should be set down to the individual user level. Other aspects of a good content management system include the ability to capture and store large volumes of documents, the ability to create a workflow that demonstrates how one documents links to another, and the ability to reuse documents and reassemble them into new documents. Many content management systems contain collaborative features allowing multiple workers who are located in separate places to work on the same document or to collaborate in creating or editing documents and managing changing or revisions. A CMS collaborative feature will allow all changes and edits to a document from a team to be synchronized and then distributed to all team members for review. • Do some research. To find a quality content management system, do some research. Talk with other companies who already use content management systems and get their opinions. Talk with the administrators of these systems and get their recommendations. Try and use a CMS before making a decision and certainly before purchasing a system. • How easily accessible is the information stored in the content management system. The CMS should store and display the information in such a way that everyone can see it and understand it and it can be easily and quickly retrieved. This must be true for everyone in the organization, even if they are not technically handy. Many organizations allow their IT departments to choose their content management systems without input from the users and the CMS ends up being too high-tech and too complicated for their employees and customers to use. • There are content management systems which are so big information can actually get lost in the system. Companies should purchase a CMS that is sized to handle their information needs so that the information is managed, but doesn’t get lost. Designing a perfect intranet for your company, the type of content management system you use is the single most important factor you will need to consider. The content management system is the set of technologies which will facilitate the management, processing, and collecting of digital information across a variety of mediums. A quality CMS will allow your company to collect all relevant information from multiple sources, share it among your employees no matter where they are located anywhere in the world, organize this information, store it, present it to your customers, and even allow your customers to access it for their benefit and use. The type of content management system a company uses can make or break a company so this is not a purchase decision to make lightly. Some companies take months of research, testing, and analysis before making a final decision on which content management system to purchase. The best content management system for your company is the one that meets your company’s needs, not necessarily the most expensive or the largest or the one with the fanciest features. One thing to remember is that normal people will be using this content management system. True, they will probably have some basic computer knowledge, but they most likely will not be super technical and will not have the time to learn a very complicated new system. Your employees and customers will be much more comfortable will a content management system that is easy to understand and to operate. A good question to ask yourself is, “Could my Mother or My Grandmother operate this system?” Your Mom is probably a typical business computer type user capable of doing spreadsheets, email and word processing. If you can explain the content management system to your Mom, then you can probably teach it to your employees and your customers without too much trouble. It would also be good for your new content management system to have a WYSIWYG editor because this just makes life easier for everyone. Most of your employees and your customers will not know HTML and really are not going to want to learn. A WYSIWYG editor is very easy to learn and is pretty intuitive for even the most non-technical user. The system should load pages quickly without dragging. There is nothing as frustrating as having to wait and wait while a content management system churns and churns to load a document. Processing time is very important and that is why it is recommended that you test any content management system you are contemplating purchasing to see if it will meet your requirements. Using an intranet CMS to manage and facilitate your company’s document management and processing is a good idea, especially if your information processing is of large quantity. Just ensure that your CMS is adequate to meet your needs, but not so large your information gets lost within the system. In today’s hectic business environment, most companies find themselves generating anything from generous (at best) to serious (at worst) amounts of data during the course of a single business day. This happens every business day, and the sheer amount of data threatens to create bottlenecks (at best) in the business, or overwhelm (at worst) a business so that it loses control of its internal systems. So can a business function without enterprise content management, and if not, what does it need to do? In the short term, any business can appear to be functioning without enterprise content management. Within a project or a project team, the scale of activity can be kept under control for a time and business results can seem unaffected. But as soon as the scope of your business activities runs across more than a single team in parallel, and / or multiple projects one after the other in a series, obvious vulnerabilities will begin to show. Take the relatively simple issue of how to manage all that paperwork generated by a project team while working on a single project. From the resumes acquired during the hiring process; the minutes of team meetings (draft and then later ratified); the piles of receipts generated from the simple logistics of getting people and information moved around; the clusters of project authorization requests and work orders; the invoices generated in the course of doing business; – everything about your volume of paperwork requires an increasing number of person hours just to stay on top of the project. At what point do you or your team recognize that you have a paper problem? When the ‘In’ tray is full to bursting point? When the pleasant ambiance of the office is broken by clusters of archive boxes bursting with paperwork? Or when you have entire rooms dominated by rows of filing cabinets storing information that you do not actually need to access on a day to day basis, but that you cannot actually throw away? If it is hard to find just one piece of paper in among all those archives, your company is losing time and money to inefficiency. If processing each piece of paper is taking up a lot of human resources and is too slow, this is eating into your competitiveness. If paperwork cross-references other paperwork that is not co-located or easily linked up with it, then you run the risk of operating in a state of incomplete information. It exists, but you just cannot find it. Worse still, if such inefficiencies result in somebody needlessly duplicating the work of others in your organization, then you are breeding wastefulness. You are never going to completely do away with the need for paper throughout your business activities. You will always have paper and it will always play an important part in the life of your business. But isn’t there something that you could be doing right away to eliminate waste, increase efficiency and avoid bogging your workforce down in unproductive, low-vale tasks? Just by taking one decisive course of action at one point in your business activities, you could achieve massive results. Imagine a paperless customer ordering system, eliminating the need for printers and ink for that stage of your business, and removing the need to print out thousands of pieces of paper each month. Imagine giving each and every employee equal electronic access to any document within the business. It would no longer be the case that employees would need to be employed just to procure and serve the paperwork required by others. Neither would other employees need to waste precious time waiting for the paperwork to be served to them. They wouldn’t have to physically go and look for it themselves, either. They could just access the relevant information in a seamless, connected 360-degree facing system. Minimal delays, maximum efficiency. Literally, physical documents are all over the place and even electronic documents can be anywhere from this server, or that memory stick, or that laptop sitting at home today, or in a colleague’s email inbox. If even a moderately well-paid employee in your organization spends any measurable amount of time looking for a document, then your business processes become increasingly expensive. Paper files can go missing, and similarly emails, spreadsheets, and text files not kept in any kind of orderly, centralized enterprise content management system. Just one central document management system would enable everyone to find what they need and remove the severe bottlenecks that occur in any business. By almost eliminating the need for anyone to spend time searching for documents, your employees are instantly freed up to focus on just getting their jobs done. Managing the complete life-cycle of all documents, from their creation through to their destruction, is one of the most powerful efficiency bonuses that you can bring to your business. You’d obviously take care to back up your central system, so that locating all of your company’s assets in one place did not become a weakness. You might also investigate your requirements for some kind of document version control system, and effective training for all staff on how to use the new enterprise content management system. So by now the case is clear and obvious – your business needs enterprise content management in order to function smoothly, efficiently and productively – just taking into consideration the volume of paperwork that you are required to handle shows up an already pressing need. Posted on July 14, 2013 Categories Articles, Content ManagementLeave a comment on Do You Need Enterprise Content Management? Intranet is a term used to describe a private computing network that designed to only serve the needs of a given organization. The main difference that it has with the more commonly used term internet is that it represents a closed network of computers that is closed to unauthorized users. It was mainly developed at first to be used by educational organizations but soon gained major traction with private organizations as well. It is not to be confused with extranet which are networks that provide a more open access to customers and interested third parties. For that reason, many intranet networks are protected by serious encryptions as well as firewalls that enable them to really restrict the number and origin of the people who have access to their network. But it doesn’t just represent a company’s website either. Instead, it is a technological infrastructure that enables the company to process, share and organize all the information that said company needs. The main purpose of an intranet network is to reduce the cost of operation as well as the time and effort required to accomplish the necessary tasks within the company. Obviously, operating such a network requires a very efficient and highly personalized piece of software to best suit the company’s needs. These software programs are designed to provide the necessary tools to the company employees to facilitate various processes such as sales, customer relationships, productivity and management. They can also be used for effectively sharing information between the different parts of the organization. If many employees need to share information on a regular basis because they are working on a project together, a private forum or discussion board might be integrated into the system. Another thing that can be done with intranet software is to track and measure the activity of all parties who use the intranet network. That way, organisations are able to track user activity and how the information is getting shared so that they are able to optimize the different systems they have in place and get a better return on their investment. This is ultimately great for organisations that are continuously striving to improve their efficiency and improve their service. In most cases, the intranet software will only be accessible to people within the organisation. However, with the proper software options, certain parts of the intranet can be ultimately opened up to customers (or the general public) who have a need to track or better understand what they are getting out of their relationship with the organisation in question. Many large organisations actually have their own team that builds and manages their intranet software. That way, they have a tighter control on just what is happening in terms of the way their employees share information and get their work done as well as in how their customers are being served. Most of the time this task falls onto the communications department (or the equivalent). There are many benefits that can come from using a powerful and effective intranet software solution. These can range from better control of employee activity all the way to improving relationships with customers. One of the main attractions in the eyes of the company who uses it is obviously the ability to improve the productivity of their workforce. By providing tools and applications that enable them to attribute tasks more easily and more quickly, they can make better use of everybody’s time. Also, it enables the employees to access the information they need to get their job done faster. This is reflected by not only the improved access to the information in question but also by the better organization and structure of that information. Improved communication between all parties is also a very attractive benefit of a good intranet software solution. This obviously allows everybody who is working on a given project to be up to date on the most current information and strategies established by the upper management. This is also great for companies that require communication between multiple locations. Some larger organizations actually own several buildings (sometimes with different purposes entirely) that are sometimes in entirely different countries. Effective information exchange between multiple locations becomes an absolute must. Such an intranet software will mainly use email or direct chat to exchange information between parties. This cuts down on the usage of the more traditional telephone which ends up saving massive amounts of money for the company. This is especially true for organisations that have locations in different cities, states or countries because it eliminates the cost of long distance phone calls. Of course, most of these intranet infrastructures are entirely customized to the company in question because not two companies have precisely the same needs. In turn, this really helps them better serve the end customer more quickly and effectively. This is fantastic for companies who rely a lot on repeat sales from a more static base of customers because it allows them to tailor their service much more closely to their needs. Also, whenever there is a change in company policy, in the laws that govern the way the company operates or just a change to optimize the productivity or return on investment of the company, these changes can be propagated very quickly across all the locations. All the employees and parties affected by such changes can be kept up to date and implement the changes as fast as possible. This is especially important for when changes are made to comply with newly implement laws in different countries of operation. All in all an good and efficient intranet software solution is absolutely imperative for any company who is looking to optimize their processes as well as make better use of their employees and resources. What’s best is that these solutions can be fully customized to the company who is going to be using the software. That means that they can ultimately communicate better within the company as well as with any customers and also between different branches and locations that the company might have. This ends up saving time and money on all fronts. Drupal may be the official content management system (CMS) of the White House, but Joomlagov.info is a tool that could help us investigate whether or not Joomla may be the government CMS of the entire world. This innovative project not only provides a global view of how widespread Joomla happens to be in the public sphere, it also serves as an example of the CMS as a world-scale information portal and also how Joomla allows an ambitious project such as this to be brought live very rapidly. Using regional usage data from the Joomla Wiki, the developers of Joomlagov.info were able to extract enough information for nearly 1800 Joomla government websites. With sophisticated scripting the team ingested the data and was able to create a screen capture for each site. In order to facilitate site updates and ensure better management of such a large volume of mined data, the team trusted in the third-party content engine K2. The results are fairly impressive. The website currently contains information for over 3200 Joomla-driven government portals, each of which can be browsed on a world map driven by the Google Maps API. From the top level view, the map displays numbered circles that represent the total Joomla instances in a given region. From these circles the user can drill down to smaller and smaller levels until reaching an individual website. Despite the fairly large amount of data, the website manages to run with little perceptible lag. The development team achieved optimal performance with the site with minification and compression of the css/html and also by caching the site data to a size of roughly 60MB. This website is effective for educational purposes, Joomla evangelism, demonstrating how to create global-scale subject matter maps with small-scale resources, and also just satisfying the pure curiosity of finding out where the Joomla hot-spots around the world happen to lie. Enterprise content management is a term people in small to medium size businesses rarely encounter, but one that is just as critical to them as it is in large corporations. Enterprise content management, also known as ECM, is an overall strategy for managing your documents, video, photographs, graphics, engineering drawings, and any other types of content your company uses. It encompasses categories of data management like document imagining, database management, photo sharing, and any other types of record or data management. Those are just a few of the elements covered in a good ECM strategy. The best place to start to determine your company’s content management plan is to inventory all types of data used in your company. Do not rely on what your Information Technology department believes. Take time to visit with department heads in every department in your company. Visit with advertising, marketing, sales, manufacturing, customer support, finance, human resources, engineering, and any other departments your company has. You should expect a few surprises as your inventory your company’s data and content usage. It is common to discover departments have setup their own small internal content management systems, even if it is informally. You need to document how the data is stored, used, and secured. This information is crucial to creating a strategy that is embraced and will succeed in your company. These steps are essential for small companies as much as large companies. Small companies frequently have fewer controls on their data and content management allowing departments to dictate their own systems. It is time to bring them all under a single management umbrella. Why is it so important to take all of these diverse sources of content and bring them into a single system? It saves time, money, and work. How often have you watched as departments point fingers at each other about information that was not shared on a project? Most of the time the individuals involved in these disputes did not intentionally fail to share information. They had no idea they other department did not have access or that they even needed the data. When you have a well-designed content management system for your enterprise, finding the content you need becomes easy. Instead of spending hours tracking down people in other departments and trying the find the pictures, drawings, or documents, you do a quick search of the system and locate what you need. You many discover you do not have security clearance for the documents, but at least you know where they are and have a process you can use to request access. Sharing content between departments becomes easier, too. You do not need to email documents and other content. You setup shared folders and projects in your management system. Everyone involved in the project can check out the materials, add annotations, request further information, and create new content all within the project area of the system. Instead of battles between departments about data ownership and project management, you have a unified platform that encourages cross department engagement and makes sharing the data necessary for a project simple. Your employees can restrict the data they share to individual people, entire departments, or groups of people. Utilizing groups, you can setup security structures that cross department and location boundaries allowing greater collaboration and faster workflow on important projects. What kind of software is required to build your enterprise content management system? A couple popular choices are Microsoft’s Sharepoint and Oracle’s Content Management. There is a variety of other companies offering top quality solutions, including several open source solutions. You choice of content management system should be based on evaluating the types of data and what other types of systems your enterprise uses. As an example, if your company exclusively uses Microsoft products likes Microsoft Office, Exchange Server, Outlook, Microsoft SQL Server, Microsoft Project, and Windows Servers, then it would make perfect sense to look at Microsoft Sharepoint for your content management purposes. The integration of products makes implementation easier. Additionally, your IT staff is already trained to work with Microsoft products and support reducing their learning curve on the system. We want to express a small word of warning. Just because your company uses Microsoft does not always mean it is the best solution. Take extra time to evaluate your types of content carefully. Some systems excel working with images, drawings, and videos, while other systems excel working with documents, web content, and other data. Determine what your company needs to accomplish and then evaluate features. You should wait to evaluate prices until the end of your evaluation of enterprise content management systems. The purchase price of the software is just a small portion of your overall cost. Ease of implementation, ease of use, and annual fees can make a more expensive software platform the most cost effective solution. Look carefully at the costs for ongoing maintenance of the system. Ask your IT department for an estimate on installation costs and management costs of maintaining the software. The toughest job is to determine which system your company employees will accept and use. Your real return on investment comes when your employees start using your content management system to improve their efficiency and reduce the cost of storing and managing content. Take a close look at how the software functions from a standard user’s perspective. Is the interface something they are familiar with, or that they can learn quickly. Does the software offer good help screens or tutorials? Enterprise content management software can help your company take control of your documents, images, and other content that is currently scattered throughout the company. Choosing the right software is a careful balance of evaluating costs, functionality, and ease of use. If you follow our few suggestions to inventory your types of data, evaluate your current software platforms, and test with real employees, you will choose a system that gives you a fast return on investment. Almost all blogs these days make use of one of the popular content management systems (CMS). Beyond that, many very high profile websites also use CMS. For online journalists, it’s basically a requirement to understand how to use one or more of the many CMS solutions. People who are newcomers to online content production might wonder why CMS is so popular. Here are a few reasons. 1. CMS separates content from design. Sometimes, webmasters want to change the look and feel of their websites without changing the actual content. In other words, all of the words in the articles that have been posted will remain the same, but the actual design of the website (including color scheme, organization, and framework imagery) will change. One of the biggest advantages to CMS is that webmasters can change the design without altering any of the content. The two items are kept totally separate, so one can be altered without affecting the other. This is an excellent time saver. 2. CMS facilitates ease of editing. The popular CMS solutions (WordPress, Joomla, Drupal) offer editing that doesn’t require the article author to understand the complexities associated with Hypertext Markup Language (HTML). The author uses a WYSIWYG (What You See Is What You Get) editor to author articles. This means that the author can use bold, italics, etc. without being forced to use markup. The author literally sees the article in the editor as it would appear to a reader on the screen. 3. CMS is often offered freely. A lot of web host providers offer one or more CMS applications for free as part of the subscription price. This means that when someone opts to start a website, and utilizes the services of a web host provider, that person already has a CMS available to use. In other words, price is rarely a reason to notuse a CMS. 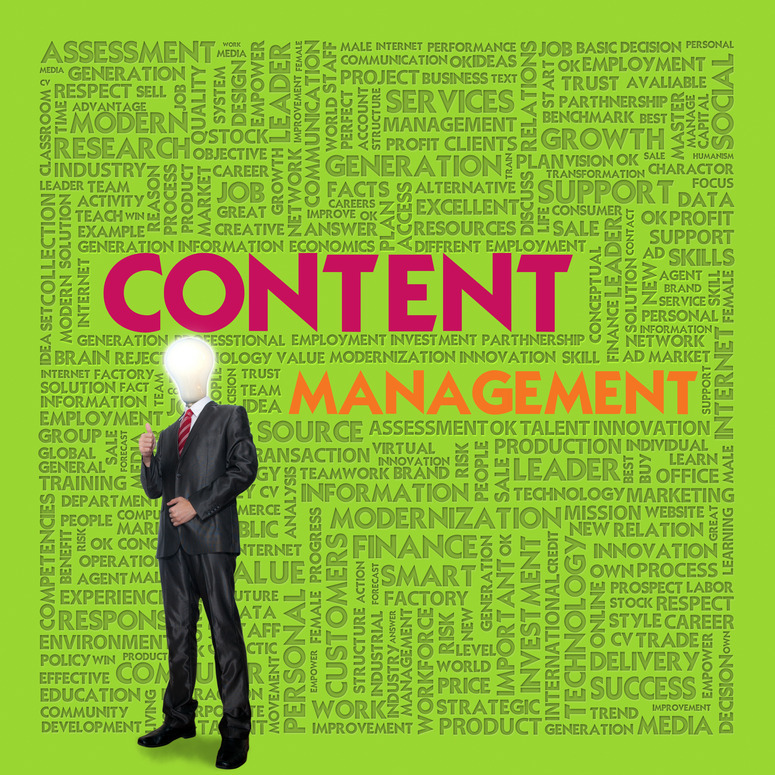 Content management is a huge market that companies are investing in now more than ever. The reason is that by investing in a solid web content management system they are able to get more customers for less money and ultimately drive up their return on investment. Because the production of information is flowing at a rate never before seen in the history of mankind, managing tat information and keeping it organized has become a priority that is at the forefront of many companies’ minds. Therefore, the web content management industry will continue to see massive growth in sales because more and more companies will be needing new, more effective systems to replace the older, obsolete ones. Workers will also greatly benefit from a better management of the content that is used at the company where they work. By gaining easier access to the information as well as more efficient ways of sorting through it they will be able to be more productive and generate more revenue for their employers. The fact is that out of all the content that is produced today, well over half of it is only in digital form. What’s more is that ratio of digital to printed content is only going to keep growing as time goes by. But even though digital content takes up much less physical space than the more traditional printed content, it is easier to get lost in the sheer amount of it. Therefore keeping it organized will become a more important priority than printed content ever needed. It’s really easy to make a mess when there is more information available to shuffle around. One of the expected trends is that the prices of content management systems will grow massively in the coming years. Some studies estimate that growth at as high as fifteen percent. The reason for that expected growth is simple; more and more companies are being ushered into the digital world and are in dire need of a way to manage all of their content and files. What’s more is that the growth won’t just come from companies that are new to using content management systems. Once again the expectation is that almost a third of the companies that are using older systems will be looking to upgrade the way they manage their content. Their hope is to make their processes more efficient and of course increase their overall revenue. But integrating any new technology requires massive amounts of planning and preparation on the part of the companies. Most businesses have thousands upon thousands of files that will have to get transferred from their old system into their new one. The difficulty in this task is to do it without interrupting the everyday operations of the company. Another potential problem that companies who are looking to purchase a new CMS will have to face is the fact that not all are created equal. The third party enterprises that create and setup these management systems aren’t all of equal quality and competency. Some horror stories of businesses purchasing content management systems for millions of dollars only to find out that their purchase was poorly optimized and limited the scope of the activities that they could use it for. What’s worse is that in some cases, the actual provider of the CMS went out of business which left the company who bought it from them alone and without support. The result is that countless companies who have bought bad systems ended up having to start over again and purchase brand new solutions. That not only means more costs in the form of buying the system, but also in planning its integration as well as the transfer from the old to the new. But beyond simply going for better systems in general, these new systems will be required to adapt to the ever changing landscape of delivery platforms. There is a constant stream of new devices coming out from tablets, to phones to net books. Therefore the trend in content management will be that the systems used will need to be highly adaptable and fluid in their design. This will be essential for all the companies who want to reach their target audience regardless if they use a more traditional computer or the newest tablet device. In addition to the physical devices used to deliver the content, the focus on the ever expanding social media world will be equally important. This means that companies will absolutely have to get a firm grasp and establish clear strategies on how to best use the various social networks to drive customers and repeat business. But a problem that companies will face on the social media level is that the users of those networks are easily distracted by the barrage of advertisements and distractions that are presented to them. Therefore to keep the attention of the prospective customer, the content delivered will absolutely have to be of higher quality. Also, the content delivered will have to come at a faster pace. People are consuming information at a faster rate than ever before. That means that maintaining engagement will require more than just quality but also frequency. The real challenge will be in how all of these new channels of information will be integrated together to create a seamless experience for the user. In addition to that, the said experience will have to be tailored in a way that doesn’t detract the user from the main purpose of the businesses’ web presence, which is to make more sales. Finally, all of this information will have to be presented in a way that is accessible and looks good on the variety of devices available. This will be a constantly evolving challenge as new types of phones and devices are constantly coming out. There might even be massive changes on the horizon in terms of the devices used by customers, as hinted by products like the google glasses. Companies will have to be constantly on their toes to make sure that they are tailoring their web content management systems to take advantage of each and every marketing avenue that they can.